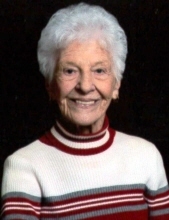 Elaine Kissee, age 97, of Marionville, Missouri, passed away at 1:15 a.m. on Wednesday, April 25, 2018, at the Republic Nursing and Rehabilitation Center in Republic, Missouri. She was born March 17, 1921, in Stone County, Missouri, the daughter of John and Martha May (Smart) Sloan. Elaine was a 1939 graduate of Crane High School in Crane, Missouri. She was the Librarian for the Barry-Lawrence Regional Library in Marionville and was a member of the First Baptist Church of Marionville. On August 10, 1939, she married Howard Wilburn Kissee, in Stone County, Missouri. He preceded her in death on April 17, 1972. Elaine is survived by her two daughters, Reitha Killman and her husband, Lonnie, and Judy Lambeth and her husband, Bud, all of Marionville; four grandchildren, Rick Lambeth and his wife, Emily, of Lee Summit, Missouri, Rena Adams and her husband, Travis, of Marionville, Randy Starbuck and his wife, Donna, of Marionville and Kevin Bigelow and his wife, Katie, of Oklahoma City, Oklahoma; 15 great-grandchildren, six great-great grandchildren and several nieces and nephews. Her parents, John and Martha, husband, Howard, brother, Charles Sloan, and three sisters, Dorothy Cantrell, Esther Steele and Catherine Estes, preceded her in death. A celebration of Elaine’s life will be held at 7:00 p.m. on Tuesday, May 1, 2018, at the First Baptist Church of Marionville under the direction of the Williams Funeral Home in Marionville. A private family burial will be held at the Marionville IOOF Cemetery. Online condolences may be share at this website. To send flowers or a remembrance gift to the family of Elaine Kissee, please visit our Tribute Store. "Email Address" would like to share the life celebration of Elaine Kissee. Click on the "link" to go to share a favorite memory or leave a condolence message for the family.